Having A Chill Out Lush Evening. I had one of my favourite shifts in work today. I worked 11-4.15pm. I love that shift because I get a lie in, and I get the evening free to do as I please too. Because I got in a bit earlier than usual I indulged in a lovely Lush bath before dinner. My lush bath bomb was a belated Christmas present from my friend Lizzy. It was amazing. I think I could have stayed in there for hours. Work was very steady today. It wasn't very busy at all, so I took the opportunity to fill my time (I had an 11-4.15 shift as well today) by changing a couple of beds, on the Homewares floor, in House Of Fraser. I genuinely found it quite therapeutic if I am being honest. I know a lot of us out there really loath doing the ironing when we're at home, though to be fair I can think of worse chores that always need doing. I didn't mind changing the beds in work. I only did two out of six anyway. That was all I had time to do. And I got a bit of help too. It definitely passed the time in work today, because our customers seemed to be non-existent. I did ache a bit after doing them however, so my Lush bath was definitely required after that. So after I had lounged in the bath for a bit with my 'ThunderSnow' ( great name! ) Lush bath bomb, I decided to watch 10 Cloverfield Lane, which I have been meaning to watch for quite a while. Having previously read the reviews, I wasn't quite sure I would like it or not, but I was pleasantly surprised. It is a bit slow in the beginning, but if you hang in there it is definitely worth a watch. Great characters and they did make the storyline very believable, even though it did take a little while. I was convinced John Goodman's character was crazy....It was very good. A bit of a weird film, but still very good. Anyhoo. 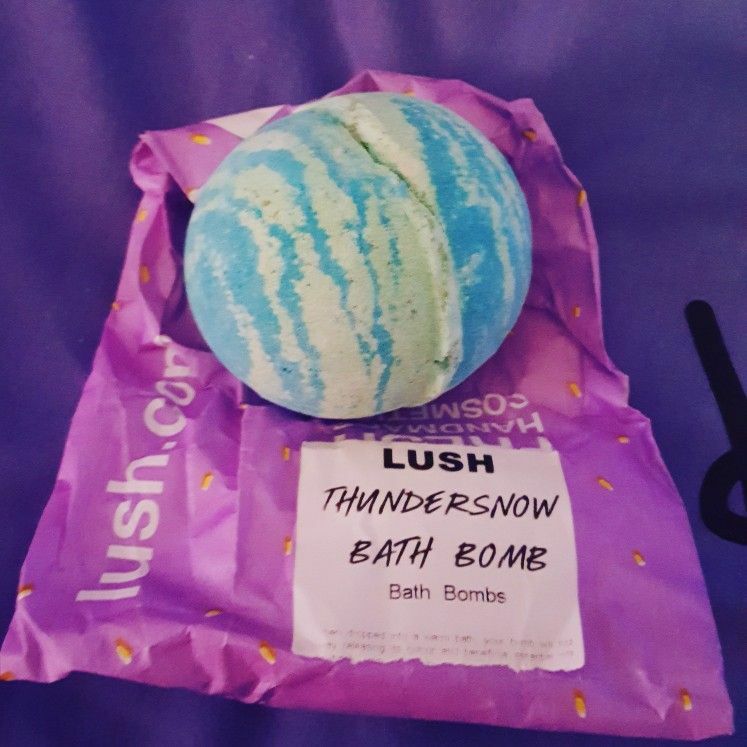 If you haven't tried the Thunder Snow bath bomb from Lush I definitely recommend you treat yourself and get one because it was just divine. Personally I haven't been into Lush for a little while now so I am thinking a little trip is now in order to see what else they have. Everyone loves a bit of Lush!